To make the most of water, it pays to use it economically. It helps to understand the needs of plants and use techniques to prevent water loss from both plants and soil. Ideally water plants early in the morning, to avoid evaporation loss during the day. On warm summer days, evening watering is also likely to be effective, the dry soil soaking it in readily and low humidity at night reducing risk of disease. To determine the need for watering, inspect the soil at a spade's depth. If the soil feels damp, there is unlikely to be any need to water, but if it is dry, then watering is probably required for some plants. Be aware that clay soils can feel damp even when all available water has been used and that sand soils can feel dry even if some water is available. The only way around this is to develop experience in matching the observed state of an individual garden’s soil to the growth rate of the plants. Wilting is usually preceded by changes in leaf position and darkening of leaf colour. For plants in pots, the compost looking paler or feeling dry to the touch and the pot becoming lighter in weight (and consequently more prone to blowing over) are all signs that the compost is beginning to dry and is in need of water. It is better to water the garden before drought really sets in, to keep the soil moisture levels even and avoid soil moisture deficits building up. Once drought has set in, it is futile to try and remedy this by light watering over a wide area. Light watering may encourage surface rather than deep roots, leaving plants more susceptible to drought. Instead, make a single thorough watering of the plants that are suffering. Try to water in the cool of the evening or the very early morning, so that less water is lost immediately to evaporation. Watering should never be carried out where drainage is poor, as adding water will do more harm than good. Roots are very susceptible to airless conditions, particularly when the soil is warm in summer. Light sandy soils need watering more frequently than heavy soils, but less water can be applied at each watering. Heavier, clay-based soils can be watered less frequently, but need heavier applications of water because they hold more water within their structure. A clay soil in which plants are wilting might need 81 litres per sq metre (17.5 gallons per 10 sq ft), and a sandy soil in which plants are wilting might need 60 litres per sq metre (12.2 gallons per 10 sq ft). 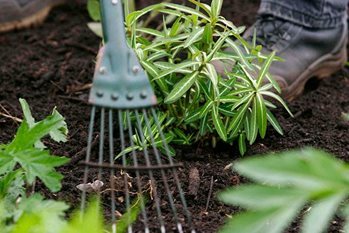 In practice, gardeners are unlikely to regularly let the soil get so dry that plants are wilting, so less water is required. Water can also be saved by applying it to the base of the plant rather than over a wide area. As a general guide, up to 24 litres per sq metre (5.2 gallons per 10 sq ft) every seven to 10 days will be sufficient to maintain plant growth. Sprinklers: These have only limited use in gardens, mainly to water the lawn where this is essential, and to raise the moisture level of unplanted areas. Hoses and watering cans: Most garden watering should be aimed specifically at the stem bases beneath the foliage canopy, leaving the surrounding soil dry. This helps to limit weed problems and ensures all the water goes where it is needed. Seep hoses: These hoses or pipes with holes in them deliver water accurately to established plants and plants in rows. They can be hidden beneath soil or mulch, which also avoids evaporation losses. They work best on heavy soil where the water spreads further sideways as it sinks than on lighter soils. Automated irrigation systems: To save time and labour, watering cans and hoses can be replaced by drip or trickle irrigation systems. Only the root zone or top 60cm (2ft) of soil should be wetted - water that penetrates deeper will be inaccessible to most plant roots. Suppliers can advise on installation of these systems. See for example, Access Irrigation, Garden Systems, or LBS Horticulture.